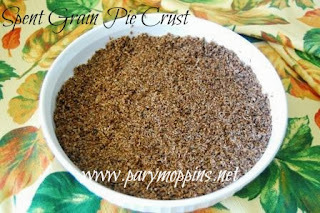 Continuing on the spent grain train (it's a pretty long train) I wanted to make a dessert this week and thought I would attempt to make a pie crust with the dried spent grains. I'm not sure that I would like this particular crust with every kind of pie. I think it might detract from that texture and flavor profile of a French Silk or delicate Lemon Chiffon pie for instance; however, I made a sweet potato pie and Momma's Pear Pie with this crust and they were great - really hearty and the slightly caramel taste in the crust complimented both the spicy earthy taste of the sweet potatoes and the juicy pears. Yes, I'm aware that it looks like a tart shell full of horse feed. Whizz your spent grains up in a food processor for a couple of pulses, just to break down the grains a little. Then put all other ingredients in the food processor with the grains and pulse until combined. Spray your pie pan with non-stick cooking spray or butter it really good. Press the crust into your pie pan. Makes 2 pie crusts. Bake at 350F for 10 minutes before filling it. This is part of Full Plate Thursday & See You in the Gumbo. This is a great pie crust, looks really good. Hope you are having a great weekend and thank you so much for sharing with Full Plate Thursday. I love grainy anything! I am definitely going to try. Your blog design is SO CUTE!!! 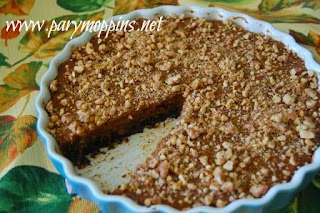 I think this crust sounds perfect for sweet potato pie--especially since you mentioned the caramel flavor. Keep that train rolling, girl! Thanks for linking. We've been down at the bottom of Louisiana on a fishing trip. No internet, so this week's link will be Monday evening. Hope you can stop in! I'm sure that I will make an appearance Ms. Michelle. :) Thanks for visiting.